Paul Cowley, CEO of First Vanadium, speaks with Peter Epstein of Epstein Research about the vanadium market and his company’s plan to fast-track its flagship project in Nevada. First Vanadium Corp. (FVAN:TSX.V; FVANF:OTCQB) is one of the better known vanadium companies. Its CEO, Paul Cowley, can be seen in a number of video clips that I linked to at the bottom of the page. Despite being a blue chip name, First Vanadium’s market cap is just US$19.5 million. This, for a company that claims to have the highest-grade primary vanadium project in North America, and a plan to fast-track its flagship project in Nevada. To top it all off, management just released a summary of its maiden mineral resource estimate. The maiden mineral resource estimate came in at 303 million Indicated pounds of V2O5 (vanadium pentoxide) @ 0.615% & 75 million Inferred pounds of V2O5 @ 0.52%. That represents a moderate increase in size and grade from the historical resource estimate of 289 million Inferred pounds of V2O5 @ 0.515%. Importantly, 80% of the new resource (in pounds of V2O5) is in the Indicated category. 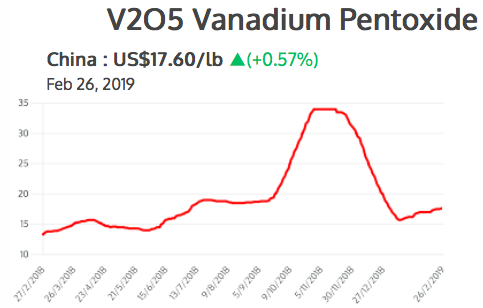 At the current vanadium pentoxide price of US$17.60/lb., the in-situ value of First Vanadium’s 303 million Indicated pounds of V2O5 alone = US$ 5.33 billion. That’s about 275x its market cap. Note: in-situ values can be misleading for early-stage projects, but they can be compared to peers at similar stage. Is vanadium for real? Will Vanadium Redox Flow Batteries cause demand and prices of vanadium pentoxide (V2O5) to soar? Will global infrastructure projects demand greatly increased amounts of vanadium-strengthened steel rebar? Please continue reading for answers to these and many other important questions. Note: Peter Epstein and Epstein Research have no prior or existing relationship with CEO Paul Cowley or First Vanadium. Please give readers the latest snapshot of First Vanadium. First Vanadium Corp. is focused on vanadium and its advanced-stage Carlin Vanadium project located in Nevada, the largest and highest grade primary vanadium deposit in North America. The company is run by professional geologists and engineers who have worked for major mining companies in senior positions in exploration, deposit discovery, construction and mining operations. The company has a tight share structure and is well funded. We just released a maiden mineral resource estimate that’s 80% in the Indicated category, and that’s larger than our historical resource, which was all Inferred. We are very pleased with these results. Why vanadium? Why not lithium, cobalt, graphite, nickel or copper? All of these minerals are going to be winners in the near future with the inevitable rapid demand increases for these metals with the commercialization of lithium-ion electric batteries in automobiles and vanadium redox flow batteries in large power storage applications. There is just not enough production of these minerals from existing mines to meet the projected demand of this exciting evolution in battery technology and commercialization. In addition, in the case of vanadium, it is chiefly used as an alloy for strengthening steel in infrastructure: rebar, pipelines, airplanes and car frames. CIBC Mellon has estimated that there will be $35 trillion dollars of global infrastructure projects starting over the next 20 years, which will spark big demand for vanadium. Tell us more about the Carlin Vanadium project. The Carlin Vanadium project is a black shale-hosted sedimentary bed of high-grade vanadium, which is shallow dipping and near-surface, making it ideal for open pit mining. The project’s superior location and infrastructure are added benefits, being located less than 6 miles by road to a major rail hub, a major highway, power and mining community. Furthermore, the grades are higher, about double that of other Nevada-based vanadium projects, and there’s significantly more vanadium metal in our deposit, also about double that of our peers. Our maiden mineral resource estimate shows the large scale and high grade of the deposit. How significant has First Vanadium’s exploration drilling been compared to historical drilling? How many new holes were drilled? The two drill campaigns that First Vanadium did in 2018 totaling 89 holes were extremely strategic and successful in both in-filling and expanding the deposit. 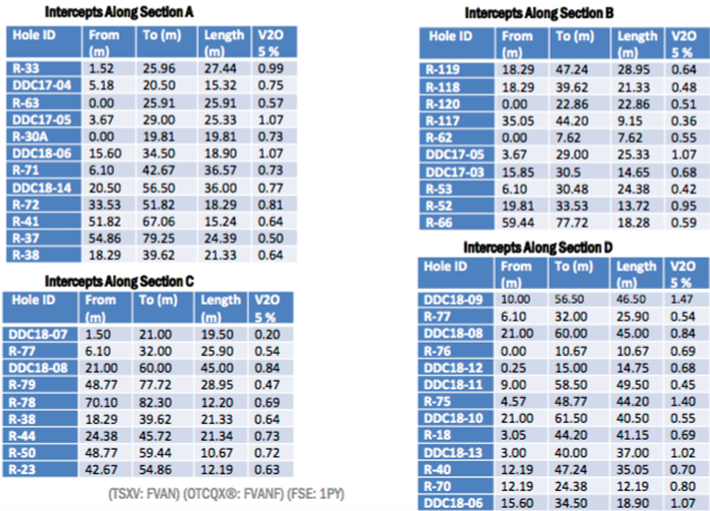 We frequently received assay values with higher grades than those found in the older drill data. This is reflected in our maiden mineral resource estimate that shows a 0.615% V2O5grade in the Indicated category alone. The infill drilling improved the confidence level to justify a high percentage of the resource being in the Indicated category. Please explain First Vanadium’s fast-track approach at the Carlin project. In the 15 months we have had the project, we quickly received permits to drill, conducted two drill campaigns, made significant inroads in metallurgy, conducted environmental studies, and delivered a significant maiden mineral resource estimate, with 80% of the vanadium in the Indicated category, all to advance the project and unlock value for shareholders. These steps are the normal steps taken by companies to advance and de-risk projects, but normally it would take three to four years to accomplish what we have done in 15 months. Is there too much talk about VRBs, which only represent 1%2% of vanadium use? Is the VRB opportunity possibly overrated? The Vanadium Redox Flow Battery has only just started to be commercialized over the last two years and currently draws a small percentage of global vanadium consumption. It will ramp up in the short and intermediate time frame to become a much more significant part of vanadium consumption. For example, one project alone in China, the Dalian project, is expected to consume 7,000 tonnes of vanadium, ~8% of annual production, the equivalent of powering 100,000 homes. You can see that the scaling opportunity is eye-opening. The VRB battery is a superior battery for storing large amounts of electricity and they are forecast to last 25 years, whereas the equivalent lithium-ion battery needs to be replaced every three to five years due to its depleting characteristics. The VRB battery is the ideal battery solution for the green energy space for large-capacity electricity storage in power grids and in wind and solar applications. Some have stated that if vanadium prices are too high, the VRB battery will not be competitive, but continuing technical advancements are being made to bring costs down. Some vanadium producers are offering to lease the vanadium in the battery to reduce costs to the end user. What do you make of the sharp decline in vanadium prices in Q4 2018? Vanadium was the best performing metal in 2018, despite the pull back at the end of the year. September and October 2018 saw a rapid increase in vanadium prices leading up to the implementation of the announced November 1, 2018, Chinese law requiring 30% more vanadium in Chinese rebar. Rapid price increases are normally followed by pullbacks as a normal reactionary correction, but eventually that pullback overreaction needed to stabilize and reflect more prevailing supply and demand factors. Naturally, the reason for the run-up in price is real and is expected to add more demand to the stage. The strong demand for the metal, and the tight supply, are still the normforcing prices up. From mid-January to late-February, the Chinese price of vanadium pentoxide is up 12.8% from US$15.60 to US$17.60/lb. (See chart below from vanadiumprice.com). We expect 2019 will be another strong year for vanadium prices. What’s the biggest risk to the Carlin project in the next 12 months? Perceptions. In the valuations of vanadium projects and their in-situ assets, and in vanadium price performance and trajectory through 2019 to provide the investor with confidence and interest in the future of this metal. Thank you, Paul, that was very helpful, I think that readers should have a much better understanding of First Vanadium Corp. (TSX-V: FVAN) / (OTCQB: FVANF) after reading this interview. Congratulations on your maiden mineral resource estimate, and continued good luck on fast-tracking the Carlin vanadium project. Disclosures: Note: Peter Epstein and Epstein Research have no prior or existing relationship with CEO Paul Cowley or First Vanadium.